“For everyone’s taste and affordable for everyone” is the motto that inspired the Ghedina family, who has passionately managed the Restaurant Pizzeria 5 Torri for over twenty years. Located in the heart of Cortina d’ Ampezzo, a few steps from Corso Italia, the restaurant is easily accessible from downtown. With 100 seats, two large rooms and a spacious outdoor terrace, it’s ideal for business lunches and dinners for groups and families. The large traditional stove and the wooden furniture make the ambiance warm and cozy. Hidden and romantic corners are available for those who look for more tranquility. The menu strictly follows the idea that all the guests should feel at ease. The culinary offer ranges from traditional local dishes, rigorously homemade following old recipes, to the most classic Italian fare. Customers can enjoy the famous casunziei all’ampezzana, filled with red beets and topped with melted butter and poppy seeds, the speck canederli (bread and meat dumplings) in meat stock or the spinach spaetzle (little green gnocchi). The menu has over 50 varieties of pizza, from timeless margherita and marinara to the most imaginative and original ones. There are also fresh seasonal salad, rich appetizers, delicious soups, elaborate or simpler starters and main courses, such as the Wiener schnitzel or the spaghetti with garlic, chili pepper and olive oil. To end on a sweet note, you can choose from mouth-watering traditional desserts and homemade cakes. 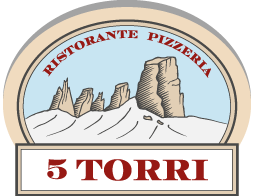 “For all tastes and budgets” is the guiding principle of the restaurant and its culinary offerings, just like “speed and efficiency” are the words that characterize the service staff at the Restaurant Pizzeria 5 Torri, always well groomed and professional. It’s no coincidence that the venue boasts a loyal and faithful clientele. Try it for yourself. Yummy Tyrolean Treats. Reasonable prices. Bonus cell charging station with lockers shows they know their customers needs! Good restaurant. No more expensive than the average for Cortina. Very busy. Good food and quick service. Perfect spot for family dinner with kids. Friendly staff. Most courses around 10-15 Euro. Good quality pizza and pasta dishes, reasonably priced and very friendly staff. Would definitely recommend.